Bangkok - Following the launch of it's all-new Hilux earlier in February, Toyota's next-generation Fortuner will arrive in South Africa later in March 2016. Ahead of the local launch, a rather special version has been revealed in Thailand - a TRD (Toyota Racing Development) Fortuner. It's called the Fortuner TRD Sportivo and benefits from sport elements courtesy of Toyota's racing division. Unlike most TRD-badged models, the new SUV gains in sporty looks rather than performance. To separate it from standard variants, the Sportivo has dark 20" alloys, side-sills with TRD logos, steel exhaust, a matte black roof, new bumpers and a powered tailgate. 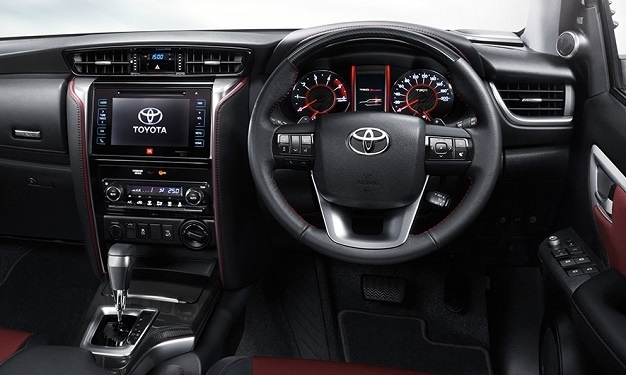 Inside, it gains black and red leather upholstery, carbon-look trim, TRD-badges, new dials and a high-end JBL 11-speaker audio system. TRD has not worked its magic on the engine, so it's 2.8-litre turbodiesel still produces 130kW/450Nm. The Sportivo however gains larger, ventilated discs all round as well as new springs and dampers. Is it coming to SA? Toyota SA says it has no plans to introduce the TRD version locally. A shame though considering the huge volumes of modified Fortuners on our roads. The new Toyota Hilux was launched little over a month ago but already the new model has reclaimed the title of SA's best-selling bakkie. Check out the top 10 best-selling bakkies for March 2016. 'The Fortuner is a rough and rugged SUV with great off-road capability and seating for seven,' writes Sergio Davids who drives Toyota's new Fortuner in SA.